There are 3 wires coming out of the body that go to the neck switch. They are White (E9), Black (C6) and Red (Output). There are 2 wires coming from the Jack mounted in the END PLATE. They are Red (Output) and Black (ground). All George L's pickups have 3 wires: Red (hot), Black, and Bare (no covering). The Black and Bare wires form ground when connected together. 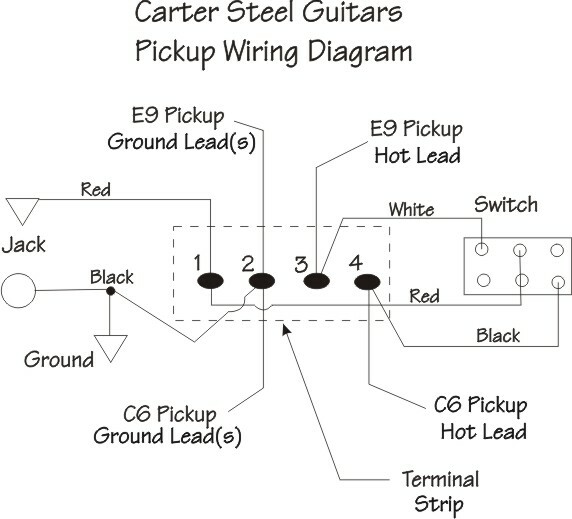 All Bill Lawrence pickups use a single white wire (hot) and a single black wire (ground). All Wallace TrueTone pickups use a single white (hot) and a single bare wire (ground). EACH of the pickup's ground wires AND the Black wire that goes to the Jack in the END PLATE. The Red Wire coming from the Jack at the END PLATE AND the Red Wire coming out of the Body that goes to the switch in the neck should be attached and then Soldered TOGETHER at terminal 1 (the left-most) of the solder strip. The Red Wire from the E9 pickup should be attached to the White Wire coming out of the Body that goes to the switch in the neck and Soldered TOGETHER using Terminal 3 or 4 of the solder strip. The Red Wire coming from the C6 pickup should be attached to the REMAINING Black wire that comes out of the body that goes to the switch in the neck AND Soldered TOGETHER using the REMAINING Terminal in the solder strip. If the E9th and C6th necks are wired in reverse, switch the pickups' HOT wires between the black and white wires that go to the switch. Use the same instructions and solder the white wire to the same location as the HOT pickup wire.